One of the classics from the year 1978. 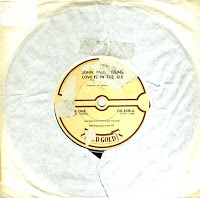 'Love is in the air' was performed by John Paul Young. It became his only worldwide hit in January 1978, peaking at number 2 in Australia, bumber 5 in the UK singles chart and number 11 in the Dutch Top 40. It's a strange thing: whenever this song is played, people get a certain look in their eyes and they can't help dancing. Reportedly, the song was covered by Cher, to be included in her album 'Believe' (which spawned the hit single of the same name). It was, however, removed from the album before it was released.